​​​Watching your baby's every movement typically brings parents so much joy. But when a baby shows signs and symptoms of a serious neurological condition such as infantile spasms, that joy can quickly turn into concern. Infantile spasms are little seizures with big consequences. Early recognition leads to better outcomes; waiting to seek treatment increases your baby's risk of permanent brain injury. Infantile spasms (also known as West syndrome) is a form of epilepsy that occurs in 1 in 2,000 children. It typically begins between 2-12 months of age and peaks between 4-8 months of age. While these seizures may last only a second or two, they usually occur close together with each spasm occurring every 5-10 seconds in a series. During a spasm, the body stiffens suddenly, the back may arch, and the arms, legs, and head may bend forward. However, infantile spasms can sometimes be hard to notice—perhaps only the eyes roll up or there is a small tummy crunch. They are most common just after a baby wakes up and rarely occur during sleep. Note: Talk to your pediatrician if your child is no longer meeting developmental milestones. Trust your instincts—you know your child best! Parents and child care providers and/or anyone wishing to educate a friend or relative about infantile spasms are encouraged to watch this video. We see a baby experiencing a cluster of individual spasms. Each spasm is less than 1 second; she exhibits a look of surprise, a brief stare, and elevation/extension of both arms. In between each spasm, the baby appears to be fine—very typical of infantile spasms. It is very important that infantile spasms are diagnosed early. If you suspect your baby may be having infantile spasms, talk to your pediatrician right away. Your child may need to be seen by a pediatric neurologist. If you can, try to video any episodes of your baby having a spasm and show this to your child's doctors. You may be told to take your child to the emergency room so a pediatric neurologist can examine your child. Your child may have to be admitted to the hospital to have a test called video-electroencephalogram (EEG) monitoring. Video-EEG is needed to verify specific brain-wave patterns during the spasms and to document specific patterns in between the spasms. Pediatric neurologists look for a distinct EEG pattern called hypsarrhythmia. The seizures' appearance and EEG are so distinct that the diagnosis of infantile spasms can be made with certainty in most cases. Determining the cause of the spasms may be more difficult. There are many causes of infantile spasms; almost any brain abnormality or brain injury can cause them. More than 50 genetic/metabolic diseases are associated with infantile spasms, and many patients have other disorders that cause developmental delays (e.g., cerebral palsy, Down syndrome, tuberous sclerosis, etc.) prior to the onset of the spasms. Determining the cause of infantile spasms is very important, because it affects treatment and prognosis. Completely stop the infantile spasms. In some cases, pediatric neurologists prescribe the seizure medication Sabril® (vigabatrin). Both drugs work well, but your child's doctor will talk with you about which medicine may be the better choice for your child. What is the Outlook for Children with Infantile Spasms? Even if the infantile spasms stop, many children develop other kinds of epilepsy and have intellectual and/or other developmental disabilities later in life. If the treatment is prompt and successful, the outlook is brighter. Normal development is possible for those who were developing normally before the spasms started. Know the signs to ‘STOP’ Infantile Spasms. See the signs: Clusters of sudden, repeated, uncontrolled movements like head bobs or body crunching. Take a video: Record the symptoms and talk to your doctor immediately. Obtain diagnosis: Confirm an irregular brain wave pattern with an EEG test. 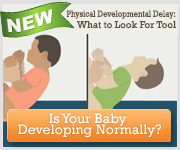 Is Your Baby's Physical Development on Track? Editor's Note: The article is published in recognition of Infantile Spasms Awareness Week (December 1-7) to help parents, as well as physicians and other health care providers, learn more about this disease and its treatments. Check out www.isweek.org for more info and join the conversation on Twitter with #ISAW2018.